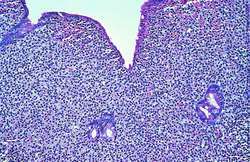 characterized by the proliferation of the lymphoid cells producing immunoglobulins, as in the gammopathies. immunoproliferative small intestine disease the gastrointestinal form of alpha chain disease, characterized by diarrhea, malabsorption, abdominal pain, clubbing, plasma cell infiltration of the lamina propria of the small bowel, and presence of an abnormal alpha heavy chain fragment in the serum; it frequently evolves into primary malignant lymphoma. a disorder characterized by small, diffuse lesions composed of cells that have features of plasma cells, histiocytes, and atypical lymphocytes. The disease mainly affects the duodenum and proximal jejunum. Patients experience diarrhea, weight loss, abdominal pain, and clubbing of the fingers and toes. Also called alpha chain disease, Mediterranean lymphoma.